The equipment offered for sale below is from my personal collection. These items are not available in quantity, usually I have only one of that item to offer. 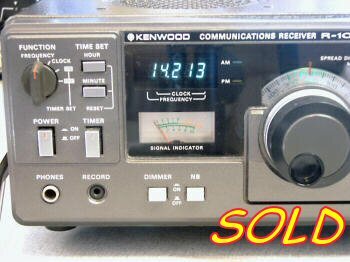 I have primarily Kenwood hybrid related equipment, but I have also collected hundreds of items from Collins, Heathkit, Bird, Shure, Astatic, Atlas, Swan, and many other manufacturers from Ham Radio's"golden era." I will offer new equipment as time permits, as I go over every piece of gear one-by-one and make sure it is better than described. My XYL thanks you in advance for freeing up some space in our house! I provide a rating system that should help you to gauge the condition of each item. I try to be very accurate, as I don't want to hear back that a piece of my stuff was not up to your standards! You can return any item for any reason for 7 days after receipt. You don't even have to give a reason. If you don't like it, simply return it. You will receive a 100% refund, all you pay is shipping. (There are no handling fees, EVER!). Let's keep it simple - I have a great reputation, and I'd like to keep it that way. You want great equipment, I want you to have great equipment also! Period. New In Box - Brand new, perfect. Unused, original merchandise, perhaps some bin rash on the box. Here's a series of pictures that provide an example of how one piece of equipment was brought back to a happy life. This mic was disassembled, cleaned, and new fabric and new shock gel was installed. It is now ready for another 35 years or so! 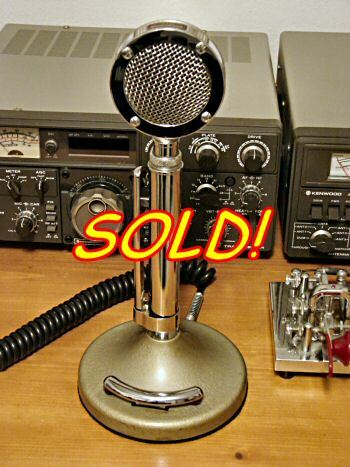 Keep a bookmark set to this page, this classic 55SW mic will be listed soon! Shure 444D labeled for Swan, but wired for Kenwood 4-pin hybrid connector. 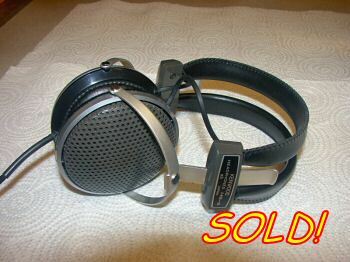 Great sound, electrically perfect, but a little rough in appearance - Mainly, a bit yellowed over the years. I rewired it and cleaned the internals, and it should sound broadcast quality for another 50 years. It actually looks pretty good, check out the pictures. Last of the KB-1 Fancy Knobs! Unknown Stars! These are "hockey pucks." 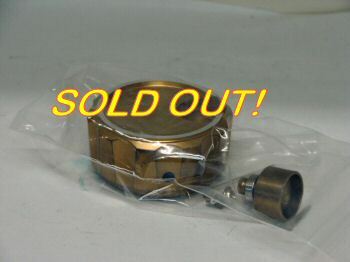 They are the very last of the KB-1 weighted metal knobs that were sold elsewhere on this site! I keep getting inquiries wanting to buy up anything I have, well, here it is! These pucks may require drilling or finishing. No guarantee or warrantee is offered. You will receive a "knob kit" absolutely not available elsewhere. Appearance-wise they are perfectly milled. The assembly may require drilling, sanding, or some other fit-up. They are all the "right size." Take a chance, you may be pleasantly surprised - or not! 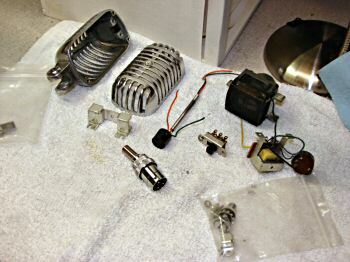 As new Air Variable capacitor with 3 sections, each measured 7.5pf to 600pf. Air gap is 0.020" so voltage rating is 1200V on a "Standard Day" !! This would obviously make an excellent loading capacitor on the 50 Ohm side of a tank or Antenna Match. With all 3 sections paralleled it would tune 23-1800pf! Again, A beautiful example of American Quality, and it has a date code stamp of 1973, so it is less than 50 years old! 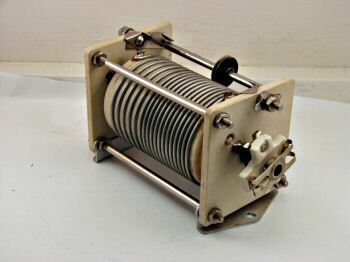 Beautiful Roller Inductor for Antenna Matches, Linear Amplifiers, all Ham related goodies! I measured this after calibrating against some fixed inductors, and read 0.1 to 11.0uH from one end to the other. This is a great example of good old American Quality of the era! 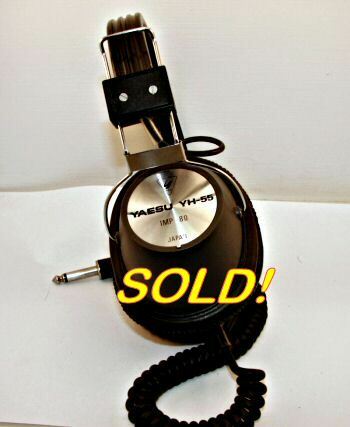 Like new set of Yaesu Communication Headphones. I tested them to be as new, great frequency response, light and comfortable with a snug fit that keeps out outside noises and distractions. These are very well made and reflect the build quality of yesteryear. Probably never used, I can't see any wear whatsoever on the soft earcups. These must have sat in a drawer unused for many years. Absolutely Mint in-the-box AT-200 that is probably brand new. Or at least it was before I opened it to clean and lube all the contacts and rotary devices! Comes in original box with original packing. They knew how to build things 50 years ago, things that would LAST! 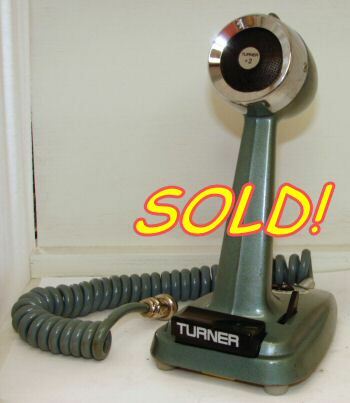 Nice example of a Turner+2 Desk Mic with switchable, adjustable gain amplifier. This mic can sound mellow, or crank up the gain to blow away pileups! Hams say the ceramic element has nicer voice reproduction than a D-104, but can get mean when cranked up to ride the rig's compression! I installed a new battery and checked it out, everything works great! 4-pin Connecter is wirerd for Kenwood hybrid radios. 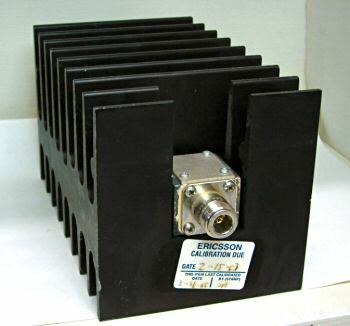 ANC-4 Antenna noise Cancellor and Diversity Combiner is an rf device that eliminates or reduces power line noise, BPL noise, computer noise, TV-generated interference, and other types of electrical noise. The ANC-4 unit connects right to the antenna connector of the receiver or transceiver to cancel locally generated noise before it gets into the receiver and affects the receiver AGC circuits. Reception of signals well below the noise level of the local interference is possible. Read all about the ANC-4 Here! Beautiful example of an Astatic D-104 microphone that looks and works absolutely brand new. With my aging memory, it might be! 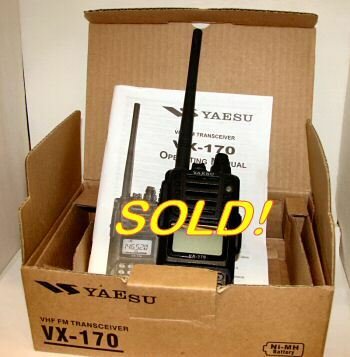 Great for DX use, this one is heard above all the others. The response curve is designed for maximum intelligibility in a pile-up. This mic does NOT include the CB style preamp. It is straight through, with a Kenwood 4-pin plug wired for the hybrids. It will plug directly into a 520, 530, 820, 830, and others with the 4-pin plug. This baby is ready to go! 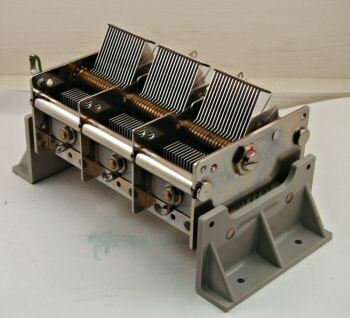 6.75" x 4.0" x 4.0"
-40 to +40C, convection cooled, Tri-Alloy N connector input. $312 retail price. 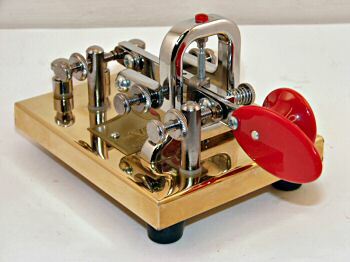 Beautiful Keyer with 24K Gold plated base, with Deluxe jeweled spring loaded movement single lever paddle, bright decorative Chrome parts. Here is the Vibroplex page. They get $322 new, and this one is as close to new unused as you can get. 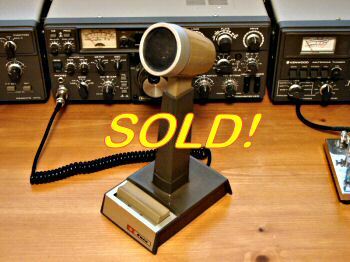 Ready for display or CW use in your shack! The list of features goes on & on! IPX7 submersible up to 3 feet for 30 minutes. 5 Watts of output (Wow! ), 700mw of audio, expanded Rx coverage, 200 memory channels, Wx channels, Emergency auto ID, Split tone, direct KB frequency entry, direct DTMF input, WIRES-II VoIP Internet linking, and a new 1900mah Sanyo eneloop rechargeable battery installed! 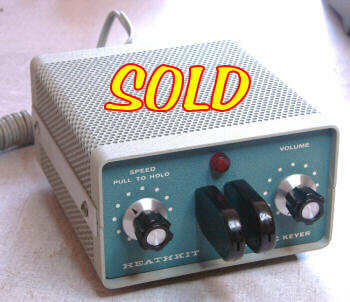 Very low use, my personal 2M emergency radio bought new and kept in a drawer!. 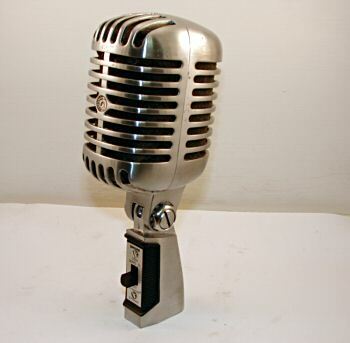 The Shure 55 Unidyne is an iconic U.S. microphone, being used by Elvis, JFK, Doris Day, Sinatra, MacArthur, Dietrich, Dean Martin, Tony Bennett, and many, many others. Why not add yourself to this list?? Great Sounding Dynamic element will work superbly with all Kenwood hybrids, and help provide that professional on-the-air sound known and loved much of this past & present century. 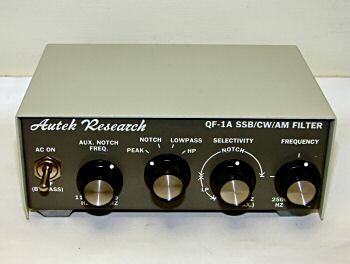 Autek Research QF-1A SSB/CW/AM Active Filter is just as new. Self powered filter will accept speaker or headphone input and output to speaker or headphone sautomatically, any combination. Power switch also auto bypasses unit for direct audio comparison. This world famous filter is a real honey! Read what they have to say in 37 reviews on eHam HERE. I think I want to keep it now! 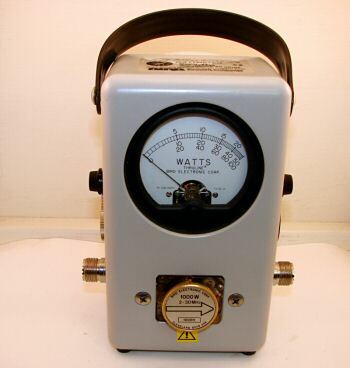 Beautiful example of a near perfect Bird 43 Wattmeter with case. This baby works great, I even used it to calibrate my everyday wattmeters on the test bench when I got it. I can't see a single scratch or scuff of any sort on this unit. One slug is included, a Bird 250H 2 to 30 MHz 250W, Perfect for Kenwood hybrid use. The other slugs in the pictures are there to show how slugs are stored on the case as you collect them! Standard N connectors for HF, VHF and UHF use. 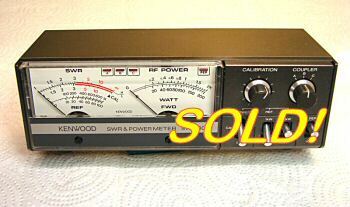 Very low time SW-2000 reports SWR and power on up to three Radios/Antennas. 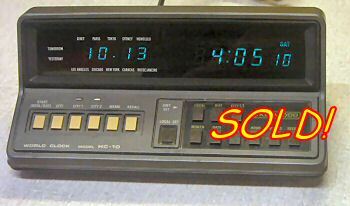 One antenna coupler is included with this meter. 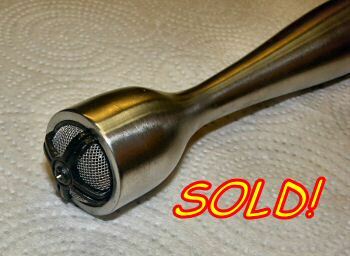 Two couplers can be added as needed, found of eBay or similar. Wattmeter can show AVG (CW) or PEP (SSB) power. Could be 5 stars, very small signs of use. Here is a keyer that I designed and built from the ground up for my station or field use. The keyer is built on a 3/8" steel plate, with magnetic repulsion used for smooth key feel, coin silver contacts, point bearings on the arms, and everything fully adjustable and lockable for your personal ultra smooth keying feel. Steel, stainless, aluminuum and brass construction, with Lexan paddles. Keyer electronics are fully Iambic, which can be used as a standard keyer as well. Fully adjustable speed from about 3-60WPM. Needs 12V at a few ma for full operation. Beautiful Low Pass Filter eliminates harmonics and spurious signals through the VHF and UHF regions including the modern HD TV bands. Overbuilt in Kenwood fashion, hand tuned at the factory, this filter is cool! Approx 2" x 1.5" x9.6" long, SO-239 connectors at each end, Less than 0.5db passband loss. 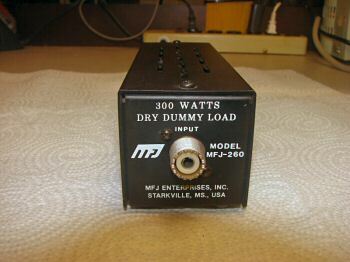 Fully functional 300W dummy load will work fine for all Kenwood hybrids. I measured the SWR at 1.06 : 1, quite respectable for any Dummy Load! This unit is usable up to 650MHz, that covers a lot of bands! SO-239 input accepts a PL-259 connector. Air cooled, see chart on back for power vs. time. Beautiful set of Kenwood Headphones. These look new, hardly if ever used. I'm taking off 1/2 star for not having the original box. Both connectors are supplied, for either 1/8" or 1/4" use. These headphones rank 4.8 stars out of 5 on just about every ranking website. They have great sound! Beautiful 1960's Vintage Lafayette PA-46 turned from solid stainless steel. Cardioid pattern Dynamic Mic is great for High Fidelity SSB radio usage. Dual impedance, 600 Ohm or 50K Ohm just by rotating the mic connector 120 degrees. Supplied with heavy stand and cable as shown in the pictures. 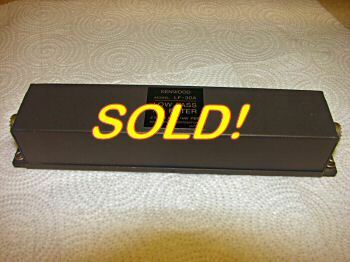 Fully working highly collectible Kenwood World Clock. Very nice, lightly used condition. Works on 100 to 240 VAC, 50/60 Hz. Great addition to your shack. Instruction Manual and U.S. and Euro plugs are included. 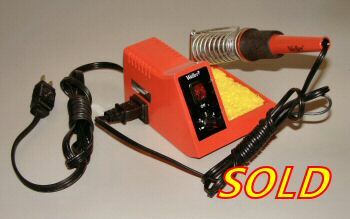 Little used Weller WLC-100 variable temperature soldering station. Tip is like new, a few scuffs on the case, otherwise like new. The only reason this doesn't get 5 stars is a few light scuffs on the band selector knob. Works as new, looks great, no mods, just a very pretty radio. 30-day Warranty, full 7-Day right of return. 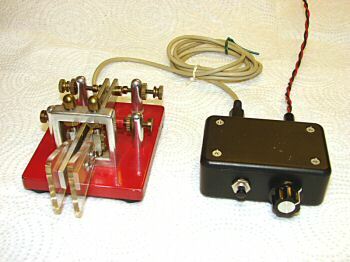 Nice example of a Heath electronic keyer. No scuffs of scrapes, but back panel shows some tarnish (see pictures). Works perfectly, I disassembled the unit and reworked the keyer mechanicals - It is smooth and ready for another 30 years or so! 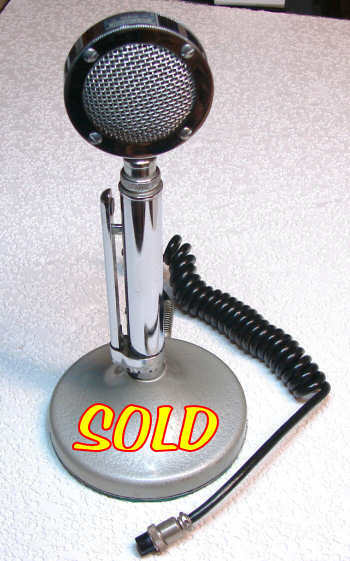 Normal wear and small pits make this an everyday use microphone - Mics like these have been sold on the auction sites as "mint," but I wouldn't put this one in my collector's case - I'd use it! 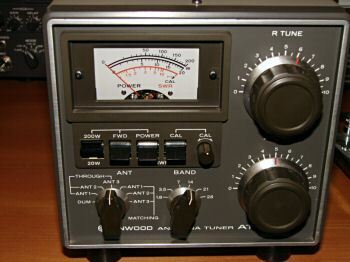 Supplied with a Kenwood 4-pin connector properly wired, tests great - D-104's have that "punch" for serious DX applications, and this is one of the amplified models. 9V battery that I used for testing and setup included. Please Watch This Page! Many, many more items coming soon!